A revitalized sanctuary movement is spreading to unexpected places, resisting the threats posed by Trump’s presidency. On the morning of February 15, Jeanette Vizguerra received an ominous text message from her pastor: “It’s not safe for you to walk around these streets.” It meant that her petition for a stay of deportation had been denied. Upon hearing the news, Vizguerra put her emergency plan into action. The 45-year old mother of four, a Mexican immigrant who has lived in Colorado for 20 years, had already packed some of her belongings and brought them to the First Unitarian Church in Denver. Standing on the steps of the white stone building that morning, she declared before a group of supporters and press that she was taking sanctuary. Living under threat of deportation wasn’t new for Vizguerra. She was ordered to leave the country in 2009, after she was caught using a fake Social Security number. But with no other criminal background and young children who are citizens, Vizguerra received multiple stays of deportation. Many undocumented immigrants found themselves in a similar state of limbo under President Barack Obama. Even as he deported a record 2.5 million people, earning him the moniker “Deporter in Chief,” his administration issued guidelines in its second term offering a measure of protection to many undocumented immigrants who came here as children or are parents of U.S. citizens. With the election of Donald Trump, however, Vizguerra’s state of uncertainty gave way to panic. Trump had pledged to ramp up deportations, including those groups deprioritized under Obama, and news accounts suggested he was directing Immigrations and Customs Enforcement (ICE) to make good on that promise. In February, a mother of two in Arizona showed up for a routine check-in with ICE officials and was arrested and promptly deported. From January to mid-March, ICE arrests of undocumented immigrants were 32.6 percent more frequent than in the same period in 2016, according to a Washington Post analysis. After the presidential election, Vizguerra’s attorney petitioned for another stay, but received no answer. With her own check-in coming February 15, Vizguerra knew it was possible that she, too, might walk into the ICE offices and not walk out freely. So when the day arrived, she instead reported to the church while supporters went to the office in her place. Vizguerra, a longtime labor and immigration activist, wanted to show her community that they had the option to fight back. “I decided to make my case public to educate people about the injustice and abuse,” she told In These Times in April, speaking by phone. After nearly three months of living in the church, Vizguerra’s gambit paid off. 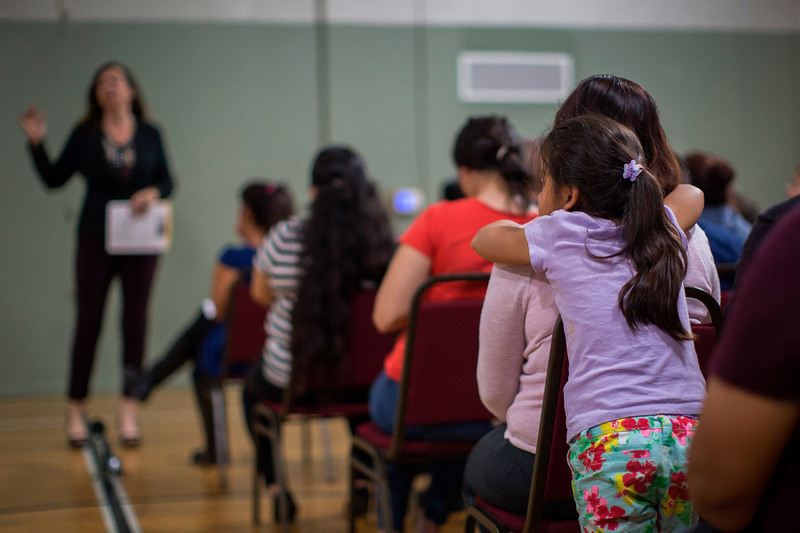 On May 11, federal immigration authorities granted her a two-year stay of deportation, allowing her to spend Mother’s Day at home with her children. “I have missed my kids—this fight is for them. And at the same time, it’s for all of the mothers and fathers who are in the struggle,” she said at a press conference as she left the church. Even before this victory, Vizguerra had become a symbol of both the grave circumstances facing undocumented immigrants and the extraordinary measures they—and their allies—are ready to take. In April, she was named to Time’s list of the 100 most influential people of 2017. For Democrats, sanctuary has become a rallying cry of resistance: Elected officials in blue cities and states have pledged to rebuff Trump’s attempts to enlist local police for immigration enforcement. Yet there’s no standard definition of what constitutes a sanctuary city, or how far one will go to protect undocumented residents. Even the protections that liberal cities like Denver provide are often thin in practice—they did little to help Vizguerra. That’s why she and other organizers are attempting to expand sanctuary beyond a set of vague legal policies, reviving it instead as a political movement. Today’s efforts recall those of the 1980s, when churches harbored as many as 2,000 refugees fleeing U.S.-sponsored violence in Central America. But activists are also updating sanctuary for the Trump era. Students are staging walkouts to demand that their campuses provide protection and resources to undocumented students and their families. Unions are negotiating contracts that bar employers from retaliating against undocumented workers. Neighborhoods are organizing block by block to protect residents from both immigration raids and police violence. All of these efforts are expanding where sanctuary takes place—and who can access it. After Trump’s victory, more churches have opened their doors as sanctuary spaces—the Church World Service estimates that the number has doubled from 400 to 800. And as Vizgerra’s case shows, the strategy has the potential to win immigration relief for people who have few options left. But physical refuge isn’t feasible for all of the estimated 11 million undocumented immigrants. Another challenge is the lack of a clear resolution. In the 1980s, there was an end goal for Central American immigrants in sanctuary—namely, winning asylum—and churches rarely had to provide long-term protection. Today, there is no such path on the horizon. That presents “a real challenge for sanctuary,” says Norma Stoltz Chinchilla, a professor of sociology and women’s studies at California State University Long Beach (CSULB). It’s also unclear whether Trump will play by the rules that have made churches a relatively safe space for immigrants. Under Obama, ICE generally followed its policy of avoiding “sensitive locations” such as churches and schools, with a few notable exceptions—in 2016, agents arrested a man in Chicago after reportedly luring him out of a church with fake text messages about his cousin being in an accident. 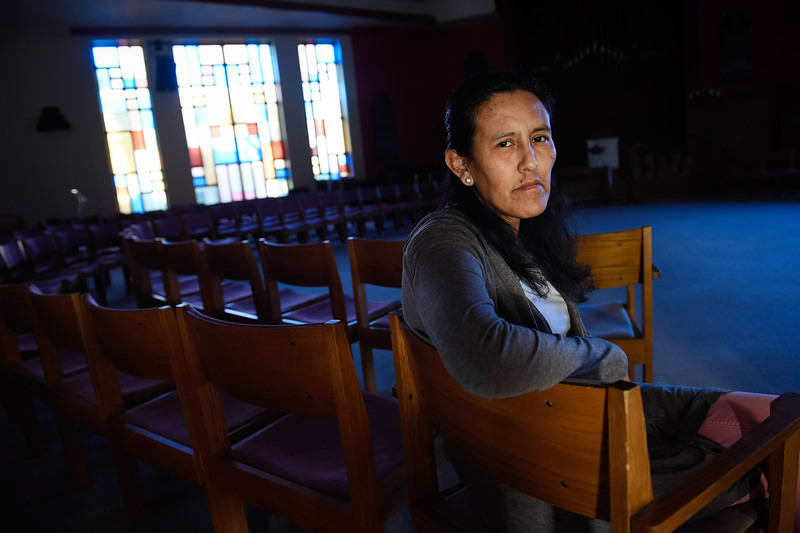 Francisca Porchas, director of Arizona’s Puente Human Rights Movement, thinks ICE under Trump will have few qualms about pushing into a church. If sanctuary’s only power is religious or moral authority, “we are skeptical that there can be a moral argument under this administration,” she says. That has led organizers to ask what a more robust form of sanctuary looks like. To start with, it will have to back up moral rhetoric with the power to enforce sanctuary through direct action. 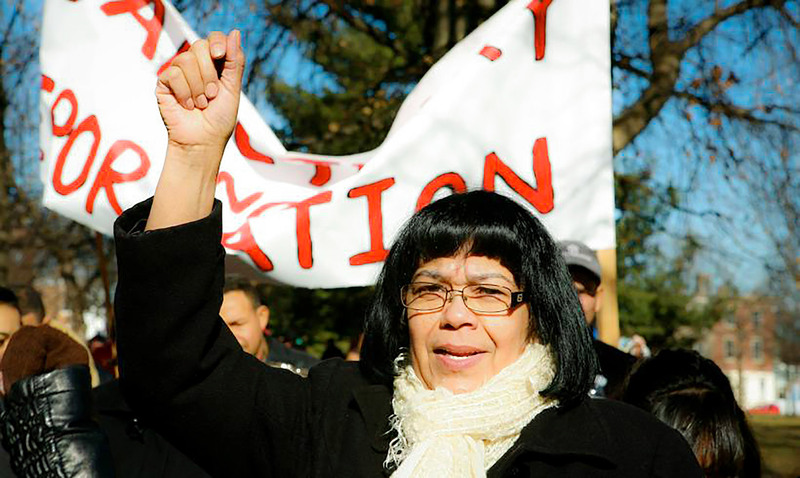 This hit home for Maria Turcios, a Honduran immigrant and organizer with the New Sanctuary Movement of Philadelphia, when she received a frantic call from a friend in 2015. The woman was hiding under a bed with her 3-month-old child as ICE raided her home. Agents had apprehended the woman’s husband as he left the house, then used his key to let themselves in. Turcios and another organizer grabbed a bullhorn and rushed over, hoping to stop the raid. By the time they arrived, the agents had already taken the family. The painful incident sparked a conversation about how to handle a surge in deportations of Central American immigrants by the Obama administration. 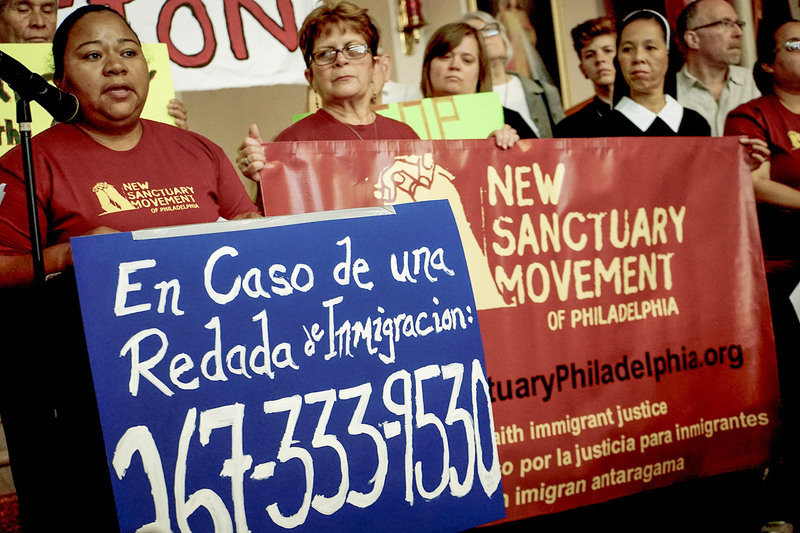 Previously, Philadelphia organizers had focused their efforts on providing refuge to undocumented immigrants within churches; Turcios’ own daughter took sanctuary for 58 days in 2014. But with surprise home raids on the rise, “we weren’t going to be able to get all those people into the church, so we started looking at other options,” explains Turcios. From there, Sanctuary in the Streets was born. It mobilizes volunteers to interrupt immigration raids in progress, based on the idea that the members of a church—not just its physical structure—can create sanctuary for vulnerable members of their congregation. To facilitate the campaign, the New Sanctuary Movement set up two hotlines to report ICE activity—one in Spanish and one in Indonesian. At first, the lines received few calls. As of April, 1,800 people have signed up to participate in Sanctuary in the Streets, up from 65 people last year. With those numbers, the group hopes to be able to deploy volunteers to immigrant-heavy neighborhoods within five minutes of a distress call. Since Trump took office, the hotline has received dozens of calls. In order to be involved in direct action, volunteers must go through a nonviolence training. “We want people not only to know what to do when they get there, but the spirit and tone of what we’re doing—that discipline of nonviolence,” explains Pedemonti. Early one morning in March, Turcios got a call from a woman whose neighbor’s home was being raided by ICE. Turcios, a small group of volunteers and several other neighbors hurried over and surrounded the home, taking photos and asking agents why they were detaining the man. The crowd grew until the ICE agents said the young man wasn’t the person they were looking for and left. Turcios counts this as an encouraging victory. Still, during the weeks she runs the hotline, she is constantly tense. Her cell phone never leaves her side, and she often finds herself glancing at it, wondering if this is the hour she’ll get an emergency call. 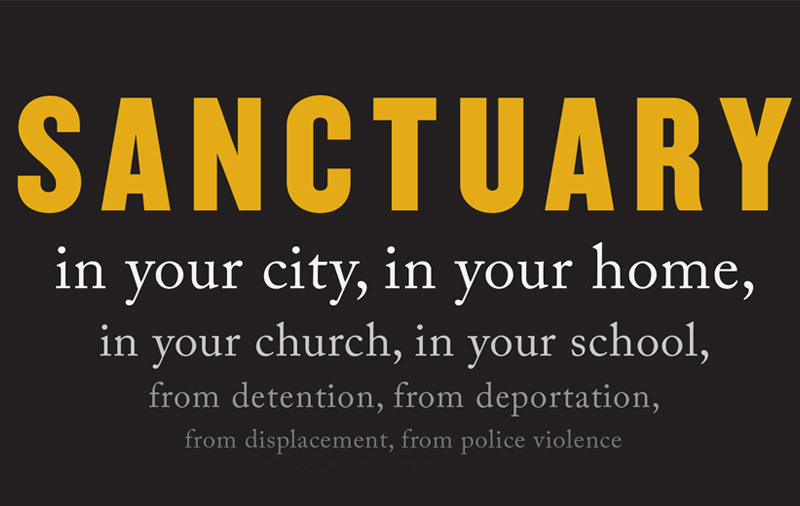 At the same time that groups build sanctuary from the bottom up, many are also pushing cities that call themselves sanctuaries to provide real refuge. 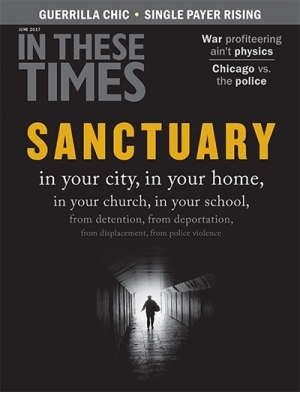 Elliott Young, director of ethnic studies at Lewis and Clark college, says that discussion of sanctuary often misses an important point: “City officials have often declared sanctuary, but then don’t take steps to see how local policing efforts deliver people to ICE.” Even if police don’t officially collaborate with ICE, immigrants are often profiled and arrested for non-violent crimes such as traffic violations. Once they’re dragged into a courthouse, they can be picked up by ICE. Take Chicago, which passed an ordinance in 2012 limiting police cooperation with ICE. The ordinance has several loopholes; most notably, police can work with ICE to detain immigrants who have a pending felony prosecution or are listed in the police gang database. Immigrant rights advocates say that these loopholes leave residents like Wilmer Catalan Ramirez vulnerable. The 31-year-old was arrested by immigration authorities at his Chicago home on March 27 and was still in detention at press time. His wife, Celene Adame, says authorities came to their door asking for a man named Rubio but then arrested her husband instead. Adame’s lawyer was told that Ramirez was in the gang database. She disputes that he was involved in gang activity, but suspects he may have ended up on the list because he was a bystander in a drive-by shooting in January. Adame also says that immigration authorities slammed Ramirez to the ground when they arrested him, fracturing his shoulder. Adame and attorneys with the Roderick and Solange MacArthur Justice Center have since filed a federal civil rights lawsuit alleging that the gang database constitutes discrimination against Black and Latino men. The suit also alleges that ICE used excessive force in arresting Ramirez and that the detention center is illegally denying him medical care. The intersection between deportation and policing creates a doubly precarious situation for immigrant communities of color. But it also presents an opportunity to expand the movement for sanctuary and offer an alternative vision of community safety. That’s the goal of Organized Communities Against Deportations (OCAD), Mijente and Black Youth Project 100 (BYP100), three community organizations creating a Black-Brown alliance in Chicago to “expand sanctuary by fighting for policies that create protections for all city residents.” First up, the coalition is mobilizing to pass the amendments co-sponsored by Ramirez-Rosa. The group is also pushing the city to remove roadblocks to accountability in its police union contract. “We recognize sanctuary should not be a single-issue movement, because we don’t live single-issue lives,” says Janae Bonsu, national policy chair of BYP100. Yana Kunichoff is a Chicago-based investigative journalist and documentary producer. Her work has appeared in the Guardian, Pacific Standard and the Chicago Reader, among others.